It’s common for people to begin collecting their Social Security benefits soon after they turn 62, ignoring the financial planners and retirement experts urging them to postpone and increase the size of their monthly checks. A new study has uncovered four powerful psychological traits that influence this decision: the individual’s expected longevity, his fear of loss, whether he perceives the Social Security system as fair, and patience. The study surveyed some 3,000 people, primarily in their 40s and 50s. This is a good age to ask about Social Security, because claiming the benefit is a few years away, “but they’re thinking more about it,” researcher Suzanne Shu said when presenting the findings at an August meeting of the Retirement Research Consortium in Washington. In an online survey, Shu, who is from the University California at Los Angeles, and John Payne, from Duke University, posed a series of questions designed to understand the psychology of the individuals they were studying. They also asked when they planned to claim their Social Security and then determined which psychological traits were linked to those who said they planned to file early. Nicole DeConinck. Photograph by Adele M. Pleatman. Having cashed her McDonald’s paycheck at a check cashing outlet in Boston’s South End neighborhood, Nicole DeConinck has completed one half of her Friday afternoon ritual. 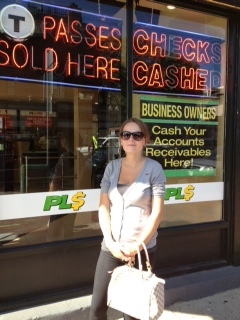 She will now walk to a nearby pharmacy to purchase a debit card, which she’ll use to make her purchases. More Americans like DeConinck say they have used non-traditional financial services, such as check cashing, or are getting loans from places like pawn shops, payday lenders, or firms that offer advances on IRS refunds. In 2011, 41 percent had, up from 36 percent in 2009, according to the Federal Deposit Insurance Corp., which insures U.S. commercial banks. One thing fueling this growth is that non-bank loans, which are ready sources of cash, are reaching new segments of the American public, according to a recent analysis of the FDIC’s data by Gregory Mills and William Monson of the Urban Institute in Washington. Once associated with minorities, immigrants and low-income workers, they found they’re more prevalent among non-Hispanic whites, college graduates, and people who earn more than $50,000. There’s a growing concern that working people aren’t saving for the future, but the reality is that many of them can barely get by in the here and now. A sizable minority of Americans say they are spending more than they earn, have overdue medical bills, or pay only the minimum on their credit cards. 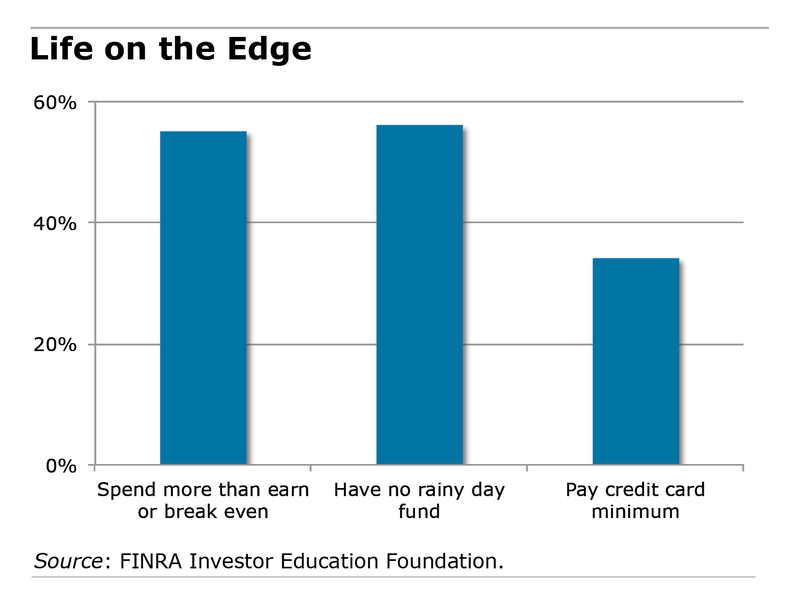 These were among the findings in the 2012 National Financial Capability Study (NFCS) conducted by the FINRA Investor Education Foundation, its second survey to illuminate the day-to-day financial issues facing average working people. Pulling together $2,000 may seem like only a modest challenge for someone with good pay and benefits. But 40 percent of the people surveyed also indicated they would be hard-pressed to find that much money if they needed it, according to a September report on the NFCS survey. •	More than half of those surveyed were in a poor position to save: 19 percent spend more than they earn, and 36 percent just break even. Poor and working people’s continual worries about money cloud their thinking and make it more difficult to perform simple tasks, concludes new research in Science magazine. This finding came out of two very different experiments – one at a New Jersey shopping mall, the other in India’s sugar cane fields – by an international team of economists and psychologists. In the first experiment, wealthy and low-income shoppers – $70,000 in household income was the cutoff between high and low – were seated in front of computers and quizzed about a variety of financial scenarios designed to trigger thoughts of their own money concerns. For example, they might have been asked whether to pay for a car repair with a loan or cash or to forgo the work altogether. Some of these scenarios were relatively easy to resolve – say, the car repair cost only $150. In a difficult scenario, it might cost $1,500. After answering a series of easy and hard financial questions, the shoppers performed simple tasks often administered by psychologists, such as picking the shape that best fits into a group of other shapes. Rich and poor performed similarly on the tasks after they were presented with the low-cost scenarios. But the high-cost scenarios caused the poor to perform significantly worse.